Working on the workshop, originally uploaded by dgray_xplane. I recently got an email from a teacher who wanted to know how she could help her students develop better presentations. I've been meaning to write down my method for awhile now and rather than write one email I thought I'd put it into a blog post. When I develop presentations I like to use index cards to sort through ideas. Sometimes I use a bottom-up approach, sorting and sifting through myriad ideas until the best ones float to the top. Other times I use a top-down approach, starting with the audience and their interests, and building a structure underneath that. More often it’s a combination of the two approaches – I start top-down, with an audience and what I think will interest them. Then I start to develop ideas, but those ideas lead to other ideas and soon I have too many thoughts, after which I need to do some bottom-up sifting to let the best ideas emerge. The image above is the sorting exercise I went through to develop a workshop I gave in Toronto in 2006. 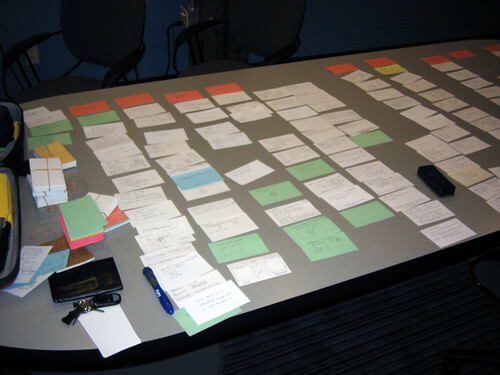 The approach borrows heavily from the card sorting method used in software design. This is best when you know who you’re presenting to and what they want to know. If you don’t know where to start this is probably the best way to begin. 1. Start by thinking about your target audience and what they are interested in. It helps to imagine a real person that you know that fits the profile. 2. Now, brainstorm a list of questions that you think they might be likely to ask you about the topic in question. Write down one question per index card. 3. Now, try to sort the questions into a sequence that makes sense. Probably this means the most basic questions (such as “What is it?”) at the beginning, and the more action-oriented questions (Such as “how can I apply it?”) toward the end. Now you can look at the questions and see if they form a meaningful sequence that, say, introduces a topic, develops it, and reaches a conclusion. At this point you should have a sequence of cards running from left to right. 4. Now, under each question card, you can start to develop your “answer” cards – slides that will answer the question. This is best when you have a lot of ideas to sort through but don’t know how to weave them together yet. If you know what you want to talk about you might want to start here. 1. Write down as many ideas on a topic as you can – all the elements that might be useful as part of a presentation. Write down one thought or idea per index card. I often like to sketch on the card as well, thinking about how I might illustrate the concept. 3. Name each pile and create a “title card” for each group. Each title card now represents a group of related ideas that might form a section of your presentation. 4. Now, try to arrange the title cards into a meaningful sequence – put the cards into a row. This forms the basis of the narrative thread. 5. Under each title card, you can now create a “column” of index cards with the ideas that form the main points for each section. 6. Now, identify gaps in the story, eliminate redundancies and irrelevant information, and go from there. As I said, usually I work with a hybrid of the two approaches. It’s much like a conversation, where one person’s thoughts influence the next person’s ideas. Moving back and forth between what the audience wants to hear (the “top”) and what I want to say (the “bottom”) helps me develop a synthesis that integrates my most valuable knowledge with what people are really interested in hearing. I’m very interested in hearing your thoughts on this approach, and I’d love to hear about your experiences using this or similar approaches in your work. So be a mensch and leave a comment!